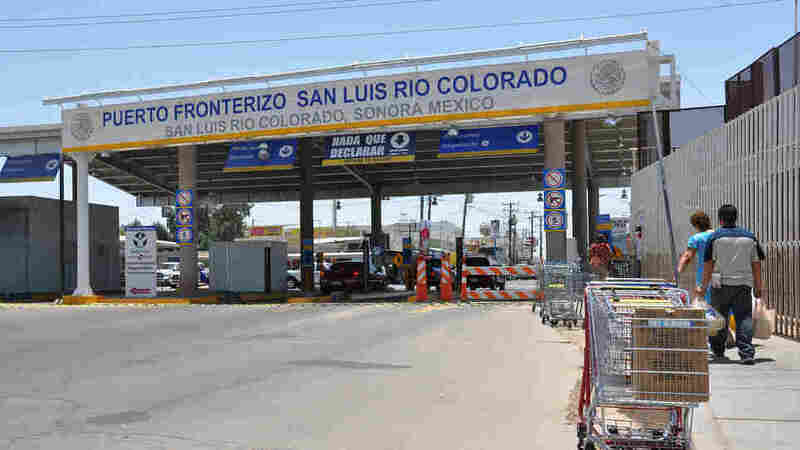 In Ariz. Town, Main Street Is A Border Crossing In San Luis, Ariz., Main Street is where thousands of legal migrants cross the border every day to work in southern Arizona's vast agricultural fields. Follow one farm laborer as he starts and ends his day on Main Street, San Luis. 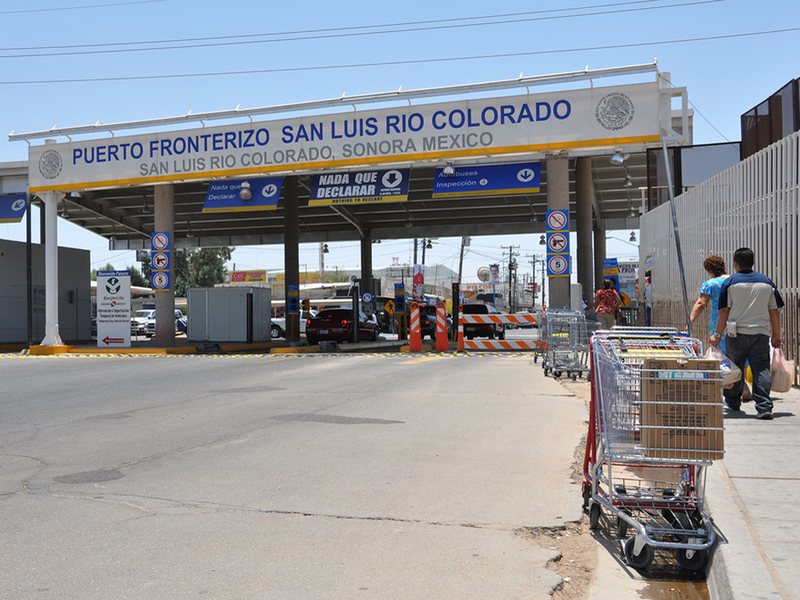 The end of Main Street in San Luis, Ariz., is a border crossing station that connects the city to San Luis Rio Colorado in Mexico. 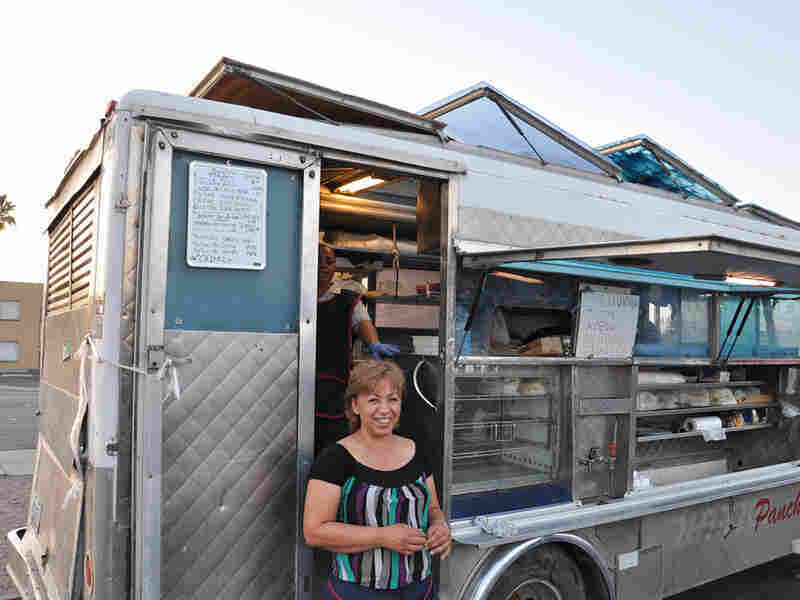 One of the busiest times of day in San Luis, Ariz., is 3 a.m. At this early hour, Main Street is lined with trailers selling breakfast foods like burritos, instant coffee and menudo, a spicy soup. The patrons are all dressed in long sleeves and workboots, carrying backpacks with a few tools and water bottles. Joel Silva was born in the United States, but has lived in San Luis, Mexico, most of his life. He crosses the border every day to work in the fields of southern Arizona. Every day, these thousands of workers wake up in Mexico and cross the border on Main Street to work in southern Arizona's vast agricultural fields. The product varies with the season — watermelon in summer months, broccoli and lettuce in the winter months. Yuma, just north, is known as the Winter Lettuce Capital of the World. "You better believe it's different here," says farm laborer Joel Silva. "You wake up 1 o'clock, 2 o'clock in the morning to cross the line and go to work and come back 5, 6, 7 p.m. so tired." San Luis is a sprawling urban region divided by the border between the United States and Mexico. The Arizona side is a small town of about 20,000. Joel lives on the Mexican side in San Luis Rio Colorado, a much larger city, having grown over the past decades to a population of more than 150,000. People from throughout Mexico have migrated to the city, drawn by the abundance of farm work available in southern Arizona. The majority are legal migrants with I-9 forms that allow them to work in the United States. During the height of the winter lettuce season, more than 40,000 workers cross through the border onto Main Street every day. 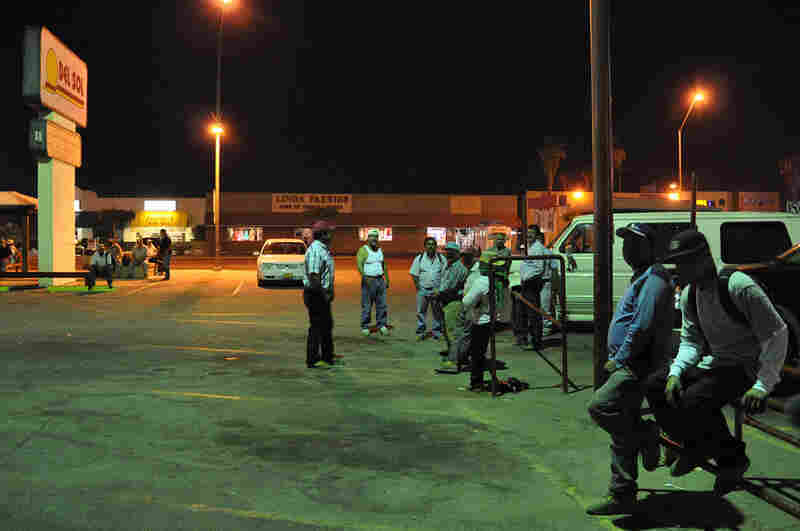 Farm laborers wait at 3 a.m. on Main Street to board a bus to the fields. A U.S. citizen, Joel is 51 years old and was born in Harlingen, Texas. His mother moved the family to San Luis, Mexico, when he was 5. Joel has been traveling to Main Street in San Luis, Ariz., all his life. When he was 12 years old, his mother would send him to Main Street to pick up milk and cheese, which were cheaper in the United States. She also, eventually, sent him to work there. "When I was 17 years old," Joel remembers, "my stepfather was sent to prison and no one in my family except for me could work. All of my brothers were in school. So my mom said to me, 'I need you to help me.'" Joel has been working as a laborer for more than 30 years. "I like to work in the fields. It's hard, but I like it," he says. "I never really go to school, only first or second grade. I've worked with my hands all my life." 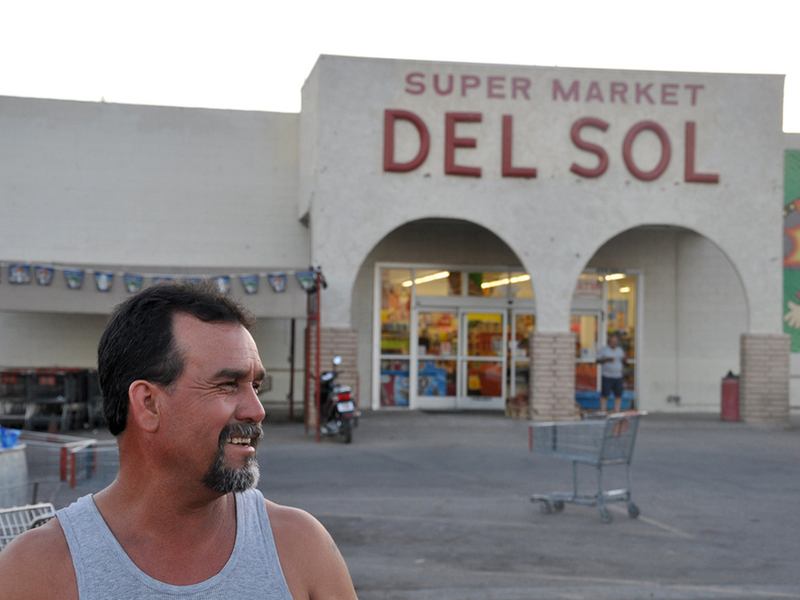 When Joel crosses the border in the morning, he heads up Main Street to the parking lot of Del Sol supermarket, where buses from various farms pick up workers and take them to the fields. Each bus has a hitch with a water cooler and two Port-O-Lets attached. During the busy seasons, there are hundreds of buses lining the various parking lots on Main Street. Before Joel heads out to the fields, he buys oatmeal from his favorite mobile food wagon, Panchita's. "I've tried oatmeal from all of these wagons, and to me, the best is at Panchita's." Georgina Escamilla sells food to the laborers starting at 3 a.m. every morning. "Menudo is their favorite," she says. Panchita's is a local restaurant in San Luis, Ariz., run by Georgina Escamilla and her husband. For her, the border is fluid. "It's like one city here, San Luis, Ariz., and San Luis, Mexico," she says. Georgina used to live in San Luis, Mexico, but in 2001 decided that she was tired of crossing the border every day and moved to San Luis, Ariz. She still gets up early, though. "We come here every morning at 3 a.m. to sell food to the guys. Lots of coffee, oatmeal, burritos, and plenty of menudo. Menudo is their favorite." Most mornings, Joel grabs his breakfast from Panchita's and hops onto one of the farm buses. He tries to get on the bus earlier than other workers so he can have a seat to himself and lay down on the way to the field. "Sometimes I sleep on the bus — snoring like a lion, believe me — and then I wake up in the fields," he says. 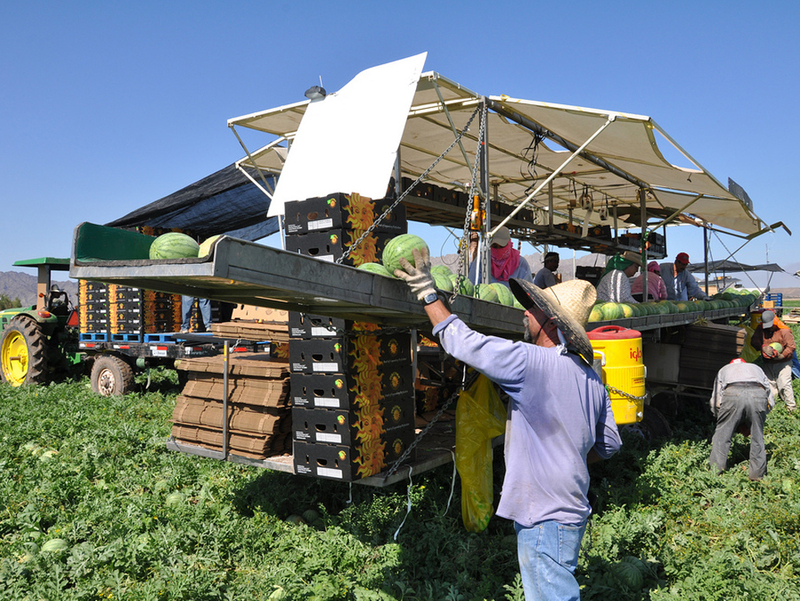 Farm laborers pick watermelons at a field in southern Arizona after traveling more than an hour by bus from the Main Street of San Luis. The bus drops Joel off about an hour and half away from the border with the other members of the crew. In the summer, it is sweltering. Sometimes the temperature tops 115 degrees. Two men are walking between the rows, picking watermelons and putting them on the oversized truck trailer, where men sift through the melons and pack them into boxes. They roll the boxes to the back of a flatbed truck, where Joel and two other men are standing. Joel lifts the boxes and stacks them, making tall columns. The flatbed truck eventually will take the watermelons to a warehouse where the melons will be distributed to Costco, Sam's Club, Safeway and other food stores across the country. "It's hard. Sometimes we don't take a lunch; sometimes we don't take a break," Joel says. "The boss, he should have 20 people working on this trailer but he only has 16. But you don't complain. You just shut your mouth." Once you start looking, you'll notice Main Streets are everywhere and tell all kinds of stories. There's a Main Street in San Luis, Ariz., that dead-ends right into the Mexican border. The Main Street in Navasota, Texas, is a gravel road in the middle of a field. Main Street is small town and urban center; it is a thriving business district and the prostitution stroll. At the end of the day, the workers clean up the trailer and get on the bus to head back to San Luis. The bus drops Joel off on Main Street in the parking lot of Payless Shoes. He walks with many others along the sidewalk, down to the border station. "You see the green and white building with the fence? That is the borderline," Joel says. "That is the end of Main Street." It's a slow procession. People are tired. "You can see the people all outside walking, all wet, all dirty," Joel says. Some have worked 14- or 16-hour days. Tonight, Joel will be in bed by 9 p.m. Tomorrow, he'll wake up again at 1 a.m., cross the border on Main Street and hope to get a seat by himself on the bus. Mapping Main Street is produced by Ann Heppermann, Kara Oehler, James Burns and Jesse Shapins. Additional help from Josie Holtzman, Sara Pellegrini, Jasmine Garsd and Edgar Arturo Barroso. Special thanks to Dave and Ellen Riek, Lou Gum and KAWC, Yuma Public Radio. Mapping Main Street is a part of MQ2, an initiative of AIR, the Association of Independents in Radio Inc., with support from the Corporation for Public Broadcasting. The project is also supported with funds from the Berkman Center for Internet and Society at Harvard University. Participate in this open documentary project by contributing stories, photos and videos of Main Streets across the country. Visit mappingmainstreet.org to join in.